Sharing My Favorite Healthy Fall Products from Trader Joe’s this year. All things pumpkin and more! Living a few blocks away from Trader Joe’s in Hoboken has been a complete game changer for us. When we lived in NYC, we never lived close enough to go to one frequently so we’d run in for random items here and there. But now to able to drive and/or walk to get some TJ goodies, has me finally feeling that Trader Joe’s bug everyone seems to get. It’s been about a year of us going at least once a week and it’s officially a staple in our weekly food haul. Many of you have been asking for my go-to products at TJ’s (what Jord and I call Trader Joe’s – no idea if this is even a thing or not). This post is focused more on their healthy fall items that they have but I promise that I will do a large guide for you soon so you can get the full run down on my faves at the store. 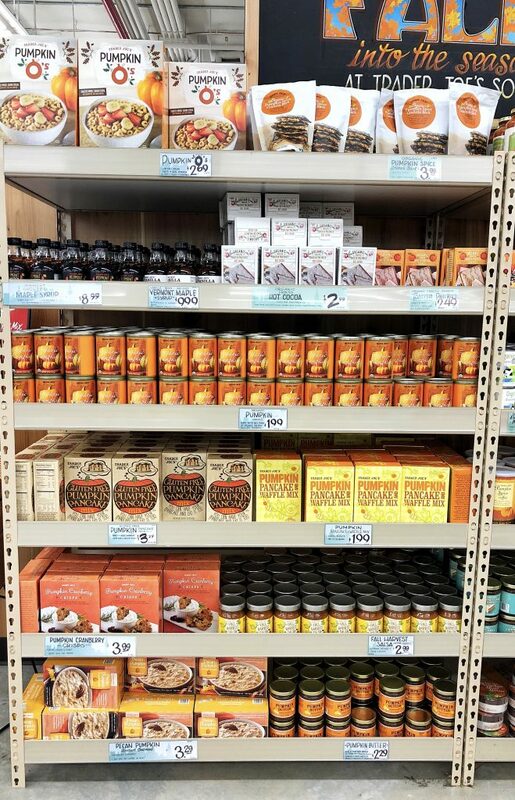 Trader Joe’s is known for their crazy product innovations (these are usually not too healthy friends), affordable prices, epic return policy, healthier options and amazing employees. When I saw that they launched their “Pumpkin Palooza” campaign for Fall, I was so excited to see what new products they had in store for us. When I recently went to do some research and taste testing, I was a bit shocked and the number of products they had a part of Pumpkin Palooza. All of them sounded absolutely delicious (I also love pumpkin things), but not many were made with the healthiest ingredients. Majority were filled with added flavors, canola oils and ingredients I couldn’t pronounce. Shows that you really need to pay attention to the label of things before you buy. There are a variety of healthier options here too but that doesn’t mean everything is healthy at Trader Joe’s! When it comes to trying some fun seasonal items, I like to have a mix of things that are both “healthy” and also a few indulgent items that I wouldn’t eat daily but they are delicious to have this time of year. I have taste tested many of what they are offering rounded up my favorites for you! Pumpkin Pie Perfect Bar – mmmmkay, you likely aren’t surprised this is ranked at number 1 for my favorite fall products at TJ’s. I nearly fell over when I found out they were going to be selling them nationwide in their stores. I always get Perfect Bar at Trader Joe’s because it is the best price ever. The bars sell for $1.99 in their stores! I could go on about my love for Perfect Bar but at this point, I think it is safe to say you guys already know. I break down why I eat these here in this blog post and still eat one every single day. Now it is the Pumpkin Pie flavor more than any other because it has me feeling like I’m actually eating pumpkin pie as a snack (heaven). If you melt it in the microwave for 5-10 seconds they get a little warm – oh my gosh, you will love. I’m going to heat one up right after this because now I’m craving one. My love for Perfect Bar aside, I also think this is the healthiest packaged option that Trader Joe’s has in its fall lineup. All whole food ingredients you can pronounce including, real organic dried pumpkin, 14 grams of protein and they snuck in superfoods like organic kale and flaxseed oil, all sweetened with organic honey. I have been in store a few times and they are sold out so I recommend making besties with someone at the store and asking them when the delivery comes in! That way you get first dibs and can stock up. Squash selection – when you first walk into most Trader Joe’s you hit the produce section first. I was beyond impressed with the squash varieties and the prices of them at TJ’.s They have small and large pumpkins, delicata squash, spaghetti squash and more. It looked like a farm stand in the middle of the store with the amount of options. 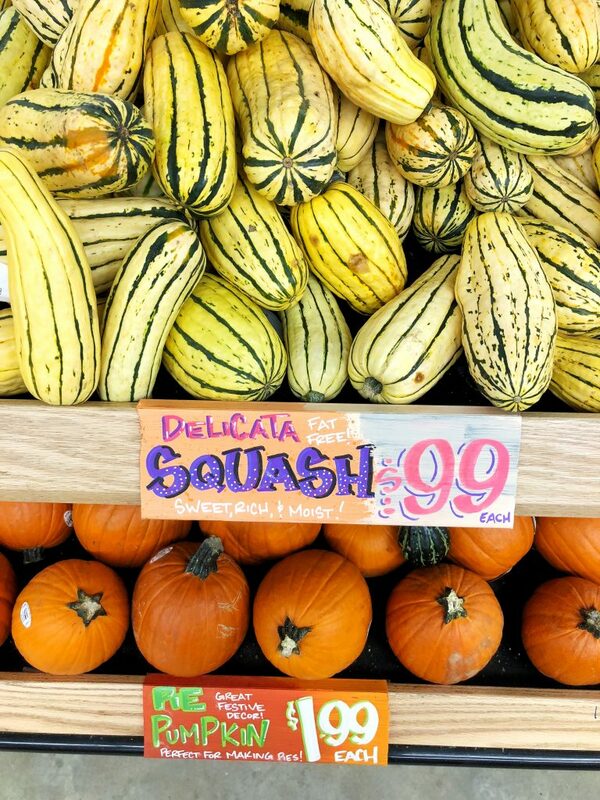 The delicata squash are only $.99 each and since I personally don’t eat the skin of these, I buy non-organic (which is what they had for most squash). Butternut Squash Zig-Zags + Sweet Potato Ribbons – there is a 99% chance you have seen these both on someone’s Instagram feed. The Butternut Squash Zig-Zags are like crinkle fries but you get to prepare them however you want. I love coating them in some avocado oil and seasoning them with black pepper, garlic and sea salt and broiling them for crispy fries. Or you can roast them for salads, omelettes, anything! Same goes for the Sweet Potato Robbins. I could never get my sweet potatoes slice this thin. Makes it so much easier to cook them quickly to add to your meal. Plus these are only $3.49 per package. Sure it is cheaper to buy the vegetable whole but I’ll spend a couple extra $$ to save time in the kitchen. Organic Pumpkin Puree – if you are anything like me, I stock up on organic canned pumpkin all year around. Trader Joe’s sells my favorite one and I think it is the consistency of it. It is great for baking and cooking so many different things and it’s so versatile. It is found in their canned food section. Here are also a few of my fave recipes using canned pumpkin: Pumpkin Pie Granola, Creamy Squash Pasta and Pumpkin Chocolate Chip Protein Pancakes. Pumpkin Spice Rooibos Herbal Blend – even before I was pregnant, I wasn’t much of a caffeine drinker. I prefer to save that for my kombucha and chocolate consumption. That means I have an insane herbal tea collection and when I finally tried the Pumpkin Spice Rooibos from TJ’s, I was obsessed. You can add a splash of nut milk too to make it more of a latte. Such a satisfying warm beverage to have (really all winter!). Mashed Sweet Potatoes – when I turned over the bag of Mashed Sweet Potatoes, I expected to see a million ingredients. But all these are made from are sweet potatoes. I love making them and adding some ghee or grass-fed butter in them for extra flavor and spices. Such an easy side dish and if you are in charge for side dishes on Thanksgiving, perfect way to cheat a bit! 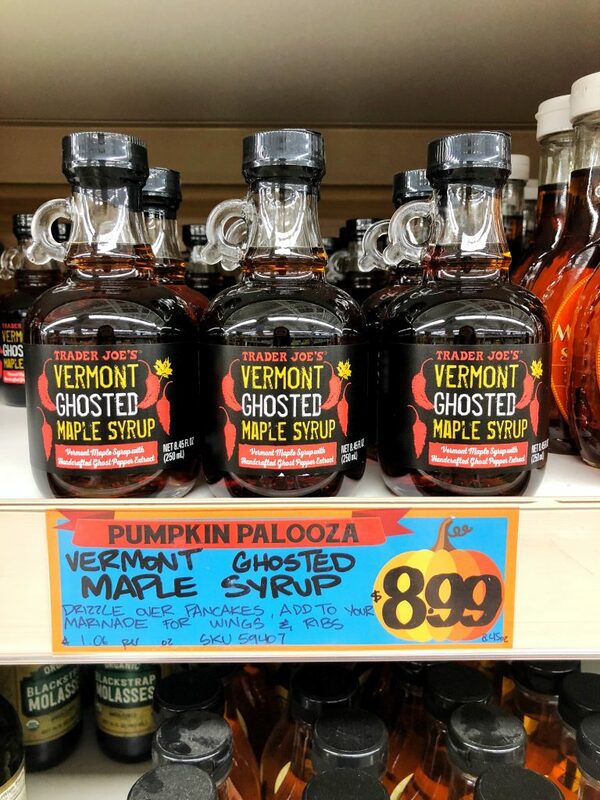 Vermont Ghosted Maple Syrup – when you eat pancakes weekly, you go through maple syrup real fast. We love trying new syrup varieties, especially after having a chili one once that even I enjoyed, which I didn’t expect. The ghost pepper added to the maple syrup is delicious and such a unique flavor. It is so good with waffles, pancakes or even to marinate chicken wings with. It is a little pricey at $8.99 but most maple syrups are a bit more expensive! 3 Seed Sweet Potato Crackers – pretty sure I could eat an entire box of these crackers. They have the best crunch to them and are made with sweet potato, flax seeds, black sesame seeds, chia seeds, yellow corn and sunflower oil. I usually try to limit my corn intake a bit but when it comes to tortilla chips or crackers like these, ya gotta do it. Dipped in a little hummus they are so good or even crushed on top of soup! They also sell beet ones, which obviously aren’t seasonal but they are delish! Organic Blackstrap Molasses – you cannot have gingerbread anything without molasses! I use the Trader Joe’s one because it is organic and completely affordable at $3.99 for a huge bottle. It is a dark thick syrup with a delicious molasses flavor. A little goes a long way in my book. This is one of my favorite finds for baking that they had compared to the mixes section that was the scariest list of ingredients ever (talking to you Pumpkin Waffle Mix!). Autumnal Harvest Alfredo – I am making this at home ASAP because it looked insane. A creamy cheesy alfredo sauce that has pumpkin puree and butternut squash in it. This is the only product I didn’t personally try (there is so much cheese going on I would have felt pretty blah) but I am so obsessed with the idea of making this that it gets an A for effort 🙂 It reminds me of my Creamy Squash Mac & Cheese so if any of my cheese lover’s are craving something ready to eat with really cheese in it, this is for you! I bet this would be amazing with the cauliflower gnocchi. Autumnal Harvest Soup – anything I can add crushed crackers on top of sounds delicious to me. The Harvest Soup from TJ’s is a creamy tomato based soup with pumpkin and butternut squash in it. It also has chunks of onion, celery and carrots in it. This product also does have dairy in it so anyone with a milk allergy, you can likely recreate this at home and sub full-fat coconut milk for the cream and butter. Since this product isn’t USDA organic, it isn’t something I’d eat daily but the ingredients list itself was pretty solid and the soup tasted amazing. 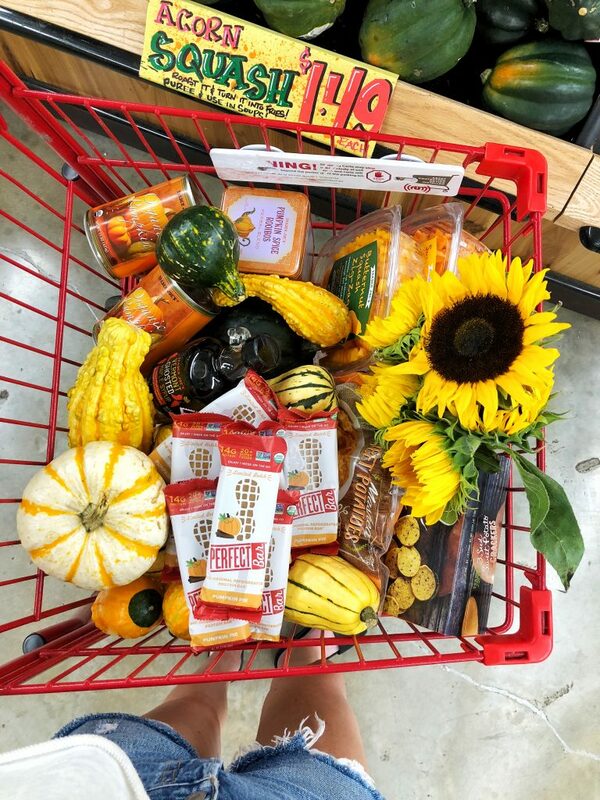 What have you guys been buying at Trader Joe’s for fall? Have you spotted the Pumpkin Pie Perfect Bars yet?! Thank you Perfect Bar for sponsoring this post. It means so much to me to partner with brands I love and believe in! I unfortunately don’t have a Trader Joe’s near me, but I always go to one when I’m visiting a friend in a city that does! I just finally found the pumpkin perfect bar at Starbucks yesterday and bought one. It’s in my fridge now; I can’t wait to try it! !